For a student of innovation, that’s exciting news. And given my interest in social, inclusive and frugal innovation, news of a low-cost car coming to market, developed for rural and off-road use, using locally-sourced materials, is even more exciting. OK, let me clarify: Kenya has been building (assembling) cars for a while now, but only as one of the players in the value chains of foreign vehicle manufacturers like Toyota, Volkswagen, Nissan, Landrover, Ford, Iveco, Mitsubishi, Isuzu and Chevrolet, etc, under the auspices of dealers like Cooper Motor Corporation, General Motors East Africa, Kenya Vehicle Manufacturers and Associated Vehicle Assemblers Ltd. So the vehicle manufacturing business is not entirely new to Kenya, which is already ranked among other countries like South Africa, Egypt, Mauritius and Morocco – countries in Africa that have relatively strong car assembly industries. However, only once before has Kenya attempted to build a car from scratch, from concept to market, using local raw materials. 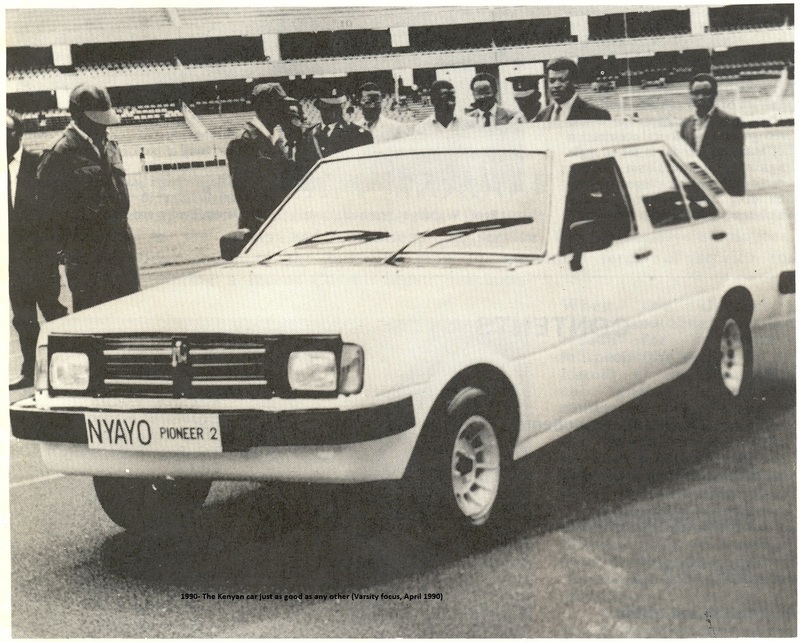 Former president of Kenya Daniel arap Moi commissioned The Nyayo Pioneer Car, a project at the University of Nairobi in 1986. Apparently he asked the engineering department at the university to design a car, “however ugly or slow”, and a prototype was built consisting of parts made by the Kenya Railways and the military, and it had a 1200cc engine and a top speed of 120km/h. Unfortunately the project collapsed after five or so years due to massive design problems and lack of financing (even with IMF capital injection). Plans to revive the project have come to naught. 20-something years later, in comes a local start-up Mobius Motors with their vision to “design, manufacture and sell durable, affordable vehicles for Africa’s mass market”. The firm, under the leadership of one Joel Jackson, and with financial backing from Ronald Lauder of Estée Lauder and a few other people, set out to build a car stripped of expensive components like air conditioning, power steering, interior fixtures, glass windows, yet coupled with with great handling, suspension, storage and fuel efficiency. The four-wheel drive car would handle Kenya’s rugged terrain and poor road network outside urban areas efficiently, while carrying a driver and 7 passengers, or hauling heavy cargo like a pickup truck. The car would cost as much an imported second-hand 8-year old Toyota Corolla, the go-to car for many Kenyan buyers. Mobius II, the second prototype which has been five years in the making, is now in the market going for approximately $10,000. 50 units have been assembled, and 10 sold (as of the Business Daily report on 23 Oct 2014). The firm has plans to expand regionally and its vision is to source more than 40 percent of components locally. This is definitely a giant step in the right direction for the manufacturing industry in Kenya, and for technological capabilities in Kenya. Of course, car manufacturing is old business if we consider the German, American, Japanese and even Chinese automobile industries. What is innovative here is the frugality of the technology – the ability to strip down a luxury product to basics, then build an appropriate technology for a given context while maintaining important safety and efficiency features, much like India’s Tata Nano. The innovation comes in identifying what’s important and what’s not in a given market, then building a modular technology. After all, Schumpeter himself described innovation as new combinations of factors, opening of new markets, and reducing the cost of production, which Mobius II is managing to do. My hope is that the local market, especially SMEs and large corporations that run large fleets of cars, buy into this technology to facilitate further development and cost reductions. Imagine the employment opportunities that would open up, the entrepreneurial opportunities in the new supply chain, the technological learning that will take place, not to mention the national pride of hosting a burgeoning industry building Africa’s first 100% homegrown vehicles. This entry was posted in Africa, Economics, Innovation, Kenya, Technology and tagged Africa, bottom of the pyramid, economic development, Innovation. Bookmark the permalink. « The Study of Innovation and Sustainability… What about Politics, Economics and Culture?